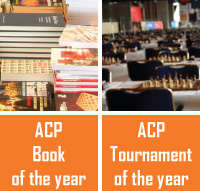 The European – ACP Women’s Rapid and Blitz Championship 2017 takes place in Monaco from October 20-24 in the Novotel Hotel. The Rapid event takes place October 21-22 and it is a very strong tournament with 9 GMs, 11 WGMs, 10 IMs and 8 WIMs participating in a field of 91 participants. The Blitz will follow on October 23. Since the Rapid event is already under way you can follow the live games with commentary by GM Sutovsky following this link.